Pictured: Members of the Chichester Chess Club in 2017. The Once again congratulations to our A Team and captain Bill McDougall, on becoming the Portsmouth Chess League Champions for the fourth year in succession. Also congratulations the B team and captain Mick Plumb on winning the Second Division title. Which rounded off another excellent season for the club. The full results, Individual averages and final league tables of this season can be found on the results page. We meet on Monday evenings from 7.15 pm at The Fishbourne Centre, Blackboy Lane, Fishbourne. The Centre offers us excellent facilities for playing chess. Please click on the “how to find us” page. Also from here you will find a link to The Fishbourne Centre’s own website which sets out the many activities the Centre has to offer. We are a friendly and welcoming chess club catering for all standards of play from beginners to County players. It is not known when the club was first formed but we have records going back well over 100 years. We run three internal club competitions and also, combined with the Bognor and Arun Chess Club, enter four teams in the Portsmouth and District Chess League but, if preferred, there is also the opportunity to play a more casual form of chess. So anyone of any standard is welcome to come along to see if playing in a club environment is for you. Ladies and juniors are particularly welcome. 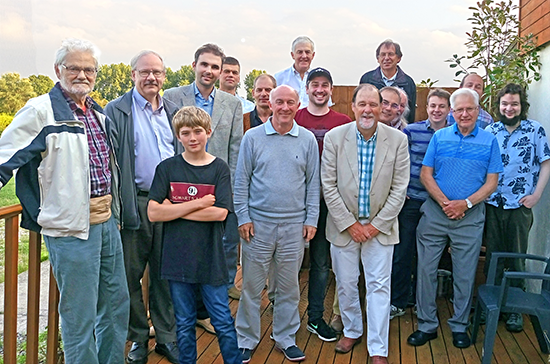 All the news you need to know about Sussex edited by Mick Plumb can be read by clicking here: Sussex Chess News. 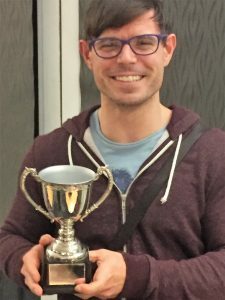 Pictured right: Andrew McDougall, winner of the Wilf Pratten Cup for achieving the highest individual average in the First Division of the Portsmouth Chess League for 2017-18.